It's taken over two months, but my wedding blogpost is finally here! I've been gathering questions since before the wedding on Instagram and Twitter, so here are the answers to them all. I don't think I was at all! I feel like I was very easy-going about the whole thing. When I was waiting to walk down the aisle with my dad, the staff member that was holding my train told me I was the "most chill" bride he had ever seen and that he could normally feel them shaking as he held their dress. In regards to how everyone looked, I thought as long as everyone had the same dresses & tuxedos, they could pretty much do whatever else they wanted to make themselves feel comfortable. I let my bridesmaids pick how they wanted to do their hair and makeup, wear whatever shoes they wanted, etc. It was more important to me that everyone felt their best instead of looking like cookie cutter bridesmaids. I think the one thing I was more of a stickler about was that I didn't want any cell phones during the ceremony - I had nightmares about people stepping into the aisle to get a photo and ruining one of the photographer's shots. I wanted to look out and see my family and friends' faces instead of a sea of cell phones. I had our officiant make an announcement before the ceremony started to please put cell phones on silent and keep them tucked away. Why did you get married on a Friday? The most simple reason is money - at most venues, it's so much cheaper to get married on a Friday or Sunday than it is to get married on a Saturday. We also liked the idea of ourselves and our guests having the whole weekend to recover and get back into the swing of things. Brett and I are also not super into being the center of attention, so we liked the idea of people coming and celebrating with us after their workday, rather than having a whole entire Saturday revolving around us if that makes sense. Mostly Pinterest - the second I got engaged I pretty much started scouring the wedding boards on there. I started with a general "wedding moodboard," where I figured out what the colors would be and a general idea of how I wanted decorations and flowers to look. Once the wedding got closer I broke it up into more specific boards - one just for wedding dresses, one for bridesmaids dresses, one for cakes, one for flowers, etc. I also started following a few wedding accounts on Instagram, but Pinterest was by far my main source of inspiration. I took some inspiration from weddings we had been to, too - we went to one big, traditional wedding and one that was a more intimate affair, so it was nice to have that contrast to pick and choose ideas from. I actually thought I had my heart set on a different venue when we first started wedding planning. I originally wanted it where my parents had had their wedding reception, but it was a little too small. I also wanted somewhere I'd be able to have the ceremony and the reception, but I didn't like the ceremony room at that venue at all. We then went to look at the Log Cabin in Holyoke, MA - I thought I didn't want to have it there because I had been to a few different events there before and felt like it would make it less special. But right before we drove over to go see it, my dad mentioned it would be nice to have it there because of the location - it's near the top of the mountain in my hometown, and depending on where you stand you can see my parents' house and Brett's parents' house from up there (we grew up down the street from each other), so that really helped change my mind. Seeing how beautiful the ceremony space was as well as the view, and the fact that they took care of so much on site and had a separate room to have the ceremony inside if it rained, made it the perfect choice for us. It was also a huge plus that we got a built-in wedding planner (who was amazing), as well as separate day-of coordinators for the ceremony and reception. How did you choose your vendors? They were actually super easy to pick, and since so much was covered by the venue, I only really needed to look for a photographer and a DJ. I knew immediately I would want Sandra Costello as the photographer - she had photographed a family friend's wedding and the photos were amazing. I loved that all of her photos on her website seemed like they were candids rather than super posed. I gave her a call and instantly knew she would be a perfect fit for us - normally I get the worst anxiety talking to strangers on the phone, but she made me so at ease, which she carried to the actual wedding day. She was great because she made everyone feel so comfortable in front of the camera, so every photo is perfect and natural. I didn't even look for or meet with more than one DJ - again I went with one who had done a family friend's wedding and who my parents said was great (Chris Bigelow from Cloud 9 Productions). 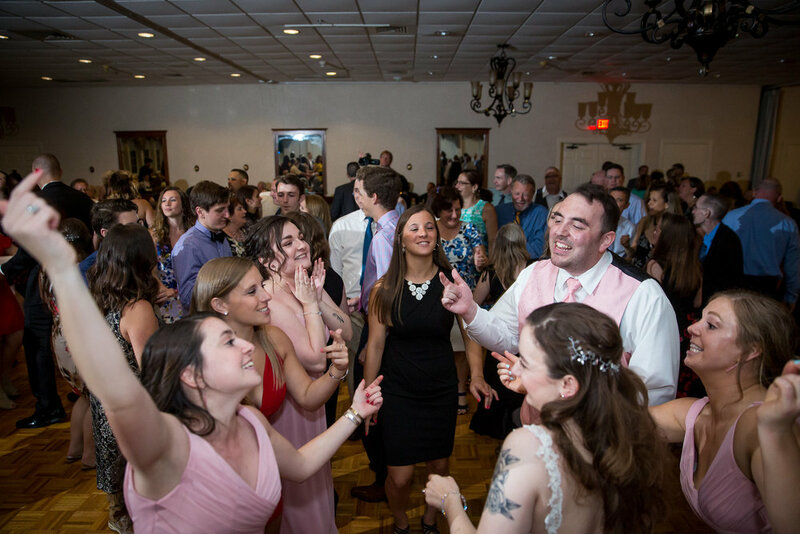 When we met with him a few weeks before the wedding to go over specifics, I knew it would be perfect - he instantly understood the kind of music I wanted, and I was confident he'd keep everyone dancing all night. And he did! I was especially impressed with how well he could read the room and know what song to play next - at one point my Bridesman went up and asked him to play Bad Romance, and he said, "Oh I'm saving it to be the last song, I thought it would be perfect for this group." How did you budget for the big day? Honestly, we kind of just winged it. We had a general idea of how much we were going to spend and how much our parents would be helping with, and luckily most things were covered under what we were paying the venue. So if you're bad at budgeting like me, I'd highly recommend looking for a venue that has many things included - things like a wedding planner, the cake, the food, and the bar were all covered under the package we chose through the venue. We also did a lot of things ourselves - I designed the save the dates, invitations, place cards, and programs, so we only had to pay to get them printed at a local printing shop. We made sure we always had a list going of everything we were paying for to keep track - there are a lot of little things that add up! How did you pick your dress? I actually ended up getting the very first dress I tried on. After looking on Pinterest for wedding dress ideas, I found I was pinning a lot that were from Maggie Sottero. So I looked up places where her dresses were sold, and there ended up being a bridal shop down the street from where I was living at the time that carried them. So I went into that first appointment with a few photos and the designer name in mind, and the consultant just knew what I wanted right away. I ended up trying on about five total just to be sure, but the first one was the one. I also got the first and only veil I tried on with the dress, too. How was the tailoring process? Pretty easy! I had it altered through the shop where I got the dress (Mariella Creations in Rocky Hill, CT). 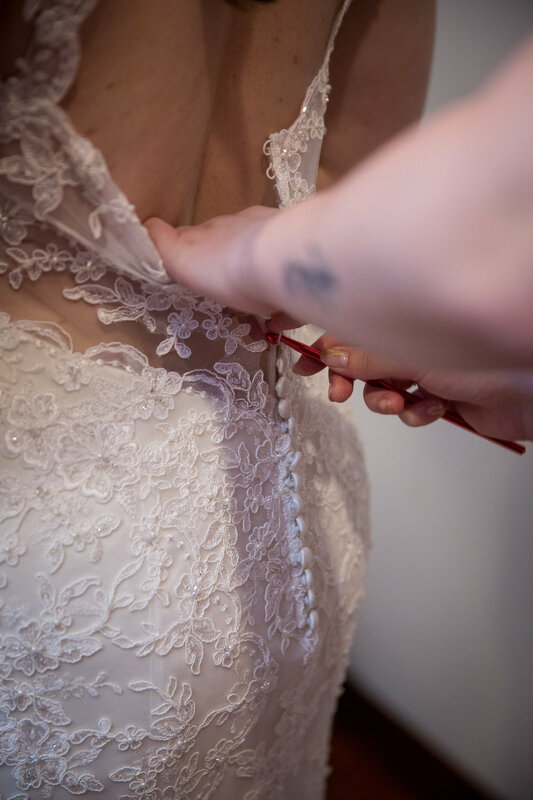 I had three fittings - the first where she did all the pinning, the second where some things were sewn and others were still pinned, and the third where everything was done and any final tweaks were made if necessary. Then they pressed my dress for me and I picked it up a few days before the wedding. I had my first fitting in the middle of January, and then it was ready for me to pick up at the beginning of June. Who was in your bridal party and how did you pick their dresses? I had my sister as my Maid of Honor, my oldest best friend as Bridesman, and my cousin that I used to spend every summer with, as well as my two best friends from my ballet days were Bridesmaids. Finding the bridesmaid dresses wasn't hard, either. I brought my sister with me to look at David's Bridal, and she probably tried more dresses on than I did when looking for my wedding dress. I already knew I wanted them to be blush pink, and I liked the shade David's Bridal had in their catalogue of colors. I found one dress that I loved and was ready to decide on that for everyone, but then my sister tried on one more with a rhinestone belt that she fell in love with. I decided since they'd all be the same color, she could have a slightly different dress as maid of honor! My Bridesman wore the same gray tuxedo and pink tie that the Groomsmen wore, but he had a pink vest instead of the gray the rest of them had. Did you do a First Look & take photos before the ceremony? Yes, we did! Taking our photos before the ceremony was important to us, because we wanted to be able to relax and start mingling with our guests during the cocktail hour. It was also nice to get to see Brett before the ceremony and spend some time alone together (with the photographer). I didn't really feel that stressed while getting ready, but I immediately felt so much calmer once I could see and talk to Brett. What personal touches did you include? 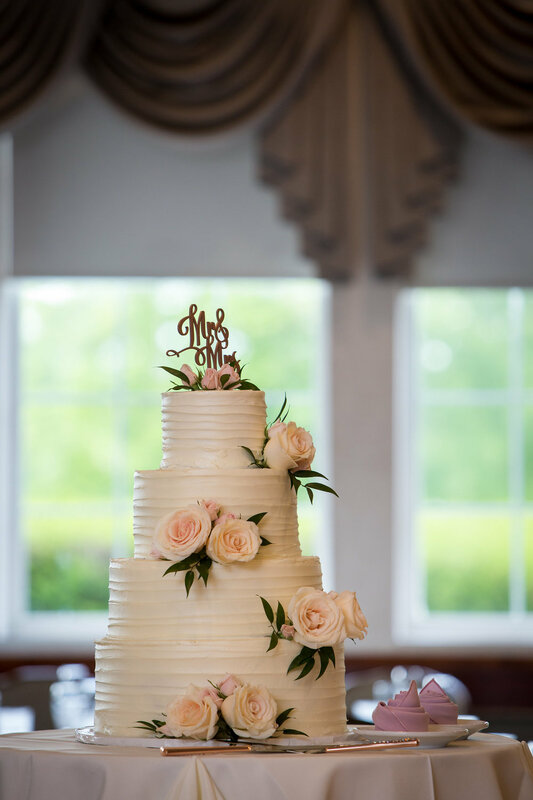 I wanted to try to include a lot of personal touches to make the day unique to us. For the ceremony, we asked my parents' best friend to officiate because she knew us well, and we knew she'd do a great job and be able to add in anecdotes that a Justice of the Peace wouldn't. I also had family members participate in the ceremony - my aunt did a reading, and my uncle and great aunt performed a song. We chose a song from West Side Story because it was Brett's grandmother's favorite movie, and my great aunt who sang also sang a song from a Broadway show (Phantom of the Opera) at my parents' wedding. We had super talented friends of my parents sing and play guitar during the cocktail hour, too. I also asked my grandfather to say the blessing before dinner, because he always gives a really nice, heartfelt blessing before our family Thanksgiving dinners. We also included a memory table with photos of family members and loved ones who had passed away. I've seen a few wedding websites saying not to do these because they're "too depressing," but it was important to us both to honor loved ones that couldn't be there. We collected photos from both of our parents, and Brett put them all together in a really nice collage. I put a lot of thought into the music that would play during the ceremony and parts of the reception too, instead of picking cliche wedding songs. My bridesmaids walked down the aisle to "Reflecting Light" by Sam Philips, aka the song Luke and Lorelai first dance to in Gilmore Girls. I walked down the aisle to the version of "Moon River" that Audrey Hepburn sings in Breakfast at Tiffany's. We all recessed to "Crazy Love" by Van Morrison. Our first dance was to "The Way I Am" by Ingrid Michaelson. My dad and I danced to "Into the Mystic" by Van Morrison, because he had told me it was one of his favorite songs a few years ago, so it then became my favorite song and I would think of him every time I heard it. What was the most surprising thing that happened at your wedding? I was surprised by how many people ended up dancing! At many points throughout the night, pretty much every single one of our guests was out on the dance floor. A joke from the rehearsal dinner (we wanted the bridesmaids & groomsmen to do some kind of dance as they entered the reception, and one groomsman jokingly said he wanted to "horse gallop") ended up carrying over to the day - everyone was doing "the gallop" in a big circle at one point and tagging other people to join in. Also, my closest family friends went up and requested the Hava Nagila and 1) I'm surprised the DJ actually played it and 2) I'm surprised that so many people joined in. 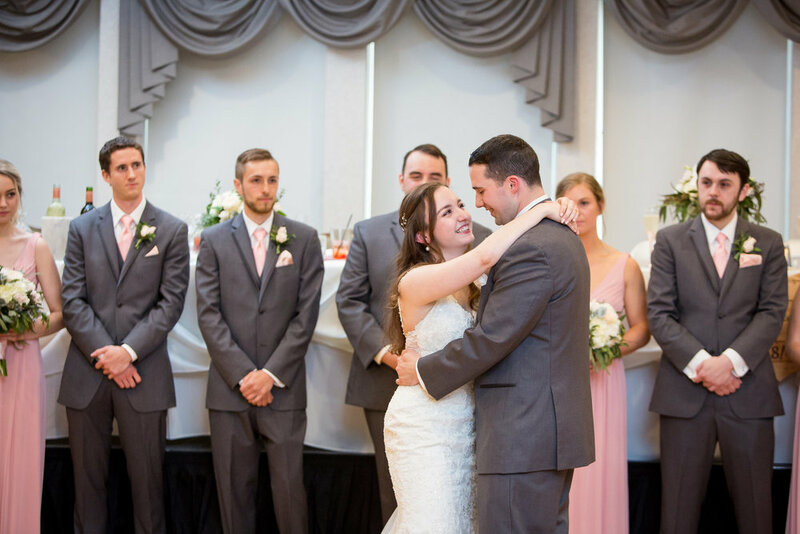 I think it's impossible to pick one thing, but Brett cried during his vows and made pretty much everyone cry, and I think that has to be my favorite moment. I also loved my dad's, my sister's, and Brett's brother's toasts, and just being able to see all my favorite people at once in one place made it the best day ever. It also still warms my heart how well my bridal party got along, too - they hadn't all met each other before my bachelorette party and yet it was like we had all been best friends forever when we were all together.